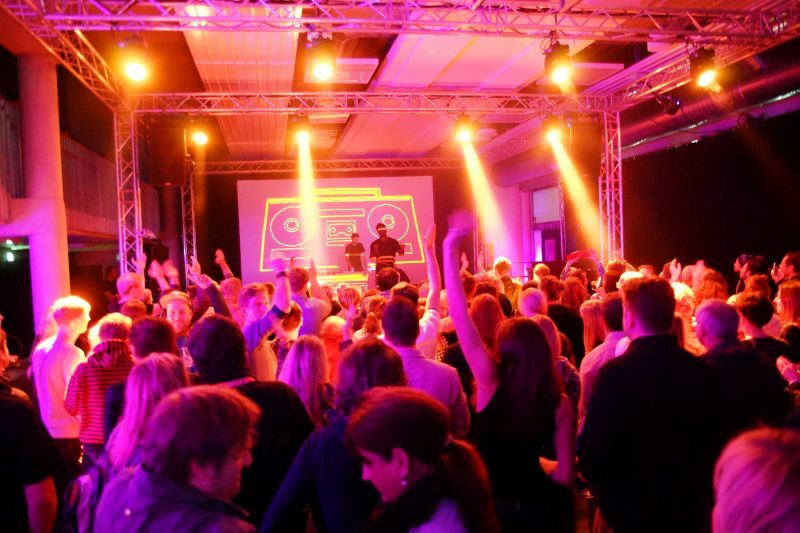 Take the brand new and architecturally successful foyer of the EmslandArena in Lingen, add a private view of the works of the photographic artist Gerrit Starczewski, all of this is underlined by beats of the 1Live DJ Klaus Fiehe and finally crowned by a solo appearance of the block party singer Kele. 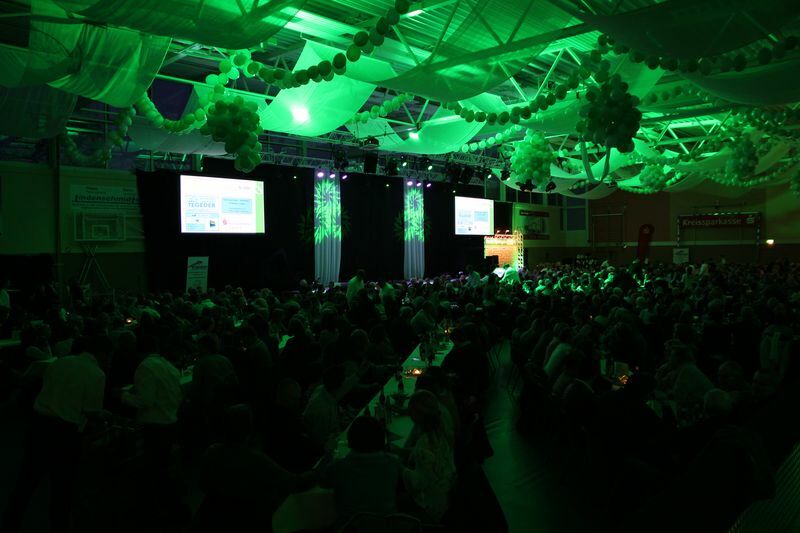 The perfect happening for more than 500 guests – thanks to the support of L&S. For the second time this year, L&S GmbH & Co. KG is taking over the equipment and organization of company jubilees as a general service provider. 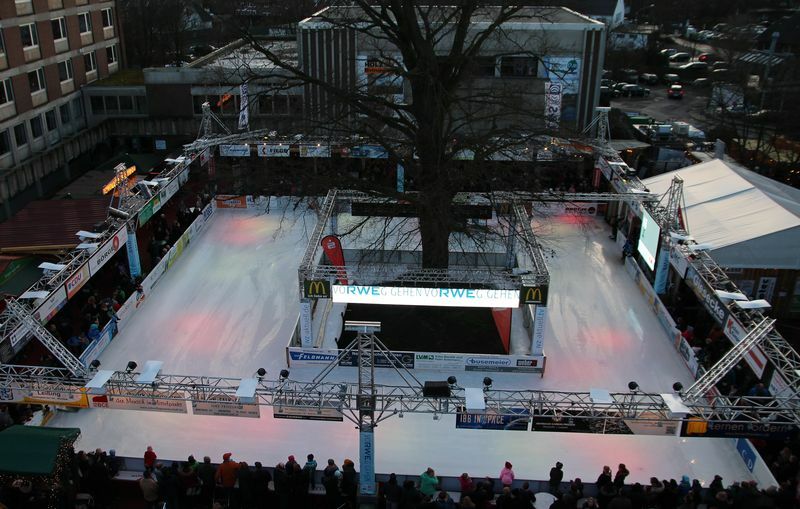 Both, the VHV Anlagenbau GmbH and the bema GmbH trust L&S. 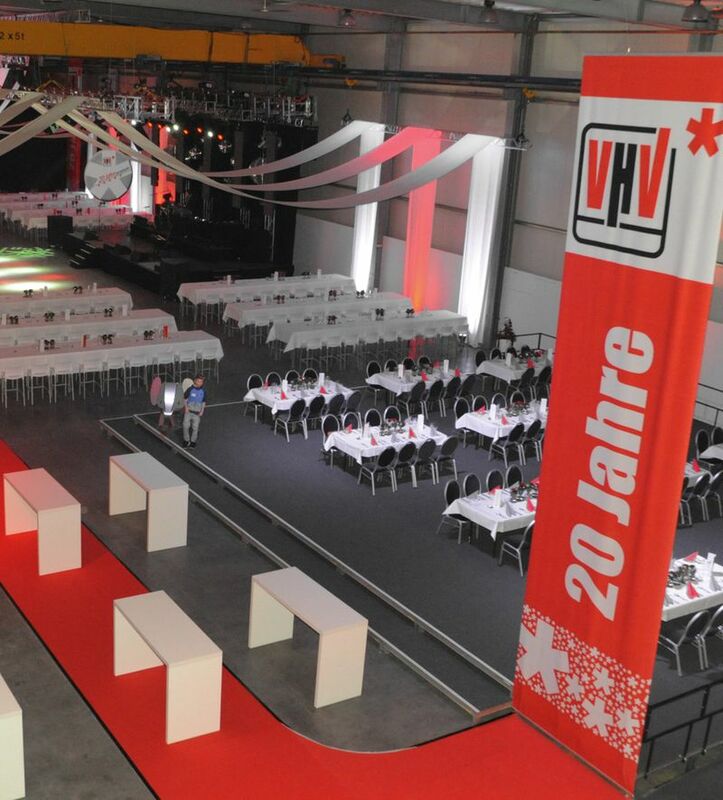 On 9 January 1995, Bernhard Veltmann, Georg Hagemann and Bernhard Verlage founded VHV Anlagenbau GmbH. 20 years later, the three managing directors can look back on a successful development. As a specialist in conveyor technology, the company has made a name for itself on the national and international markets of the bulk and general cargo industry. The company is particularly distinguished by the steep conveyor technology. With innovative ideas and tailor-made solutions, the company fulfills together with its 100 employees the requirements of customers in various sectors. The bema GmbH Maschinenfabrik was founded as a horse shoeing workshop in 1940 by the blacksmith Heinrich Berens. Later, further fields of activity were added which were very well received in the agricultural region. In the 1970s, Günther Berens, the son of the founder, continued to expand the business. Meanwhile, agricultural machinery was traded, there was a repair shop, a turning shop and a welding shop. Since 1989, bema has been constructing and building cultivation sweeping machines; in 2003 snow blades were added. In 2012, Sonja Koopmann, née Berens, took over the operations of the family business. 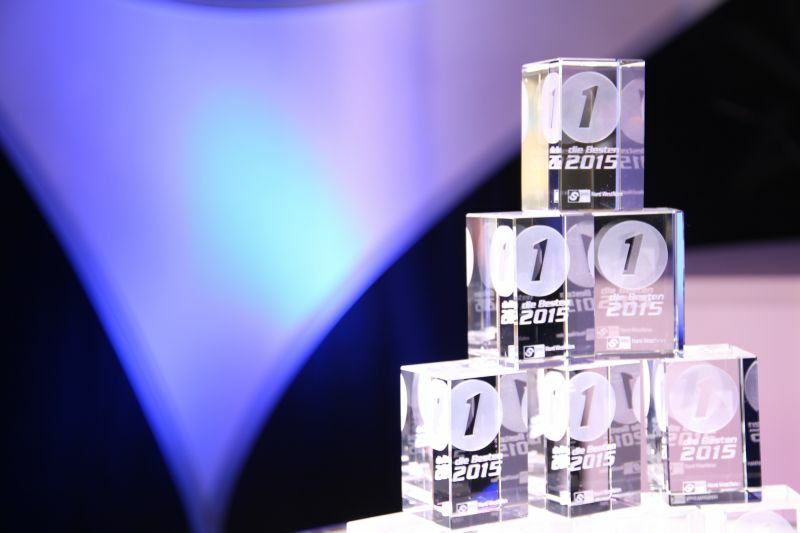 She continues the tradition of responding to individual customer requirements and delivering the highest quality. 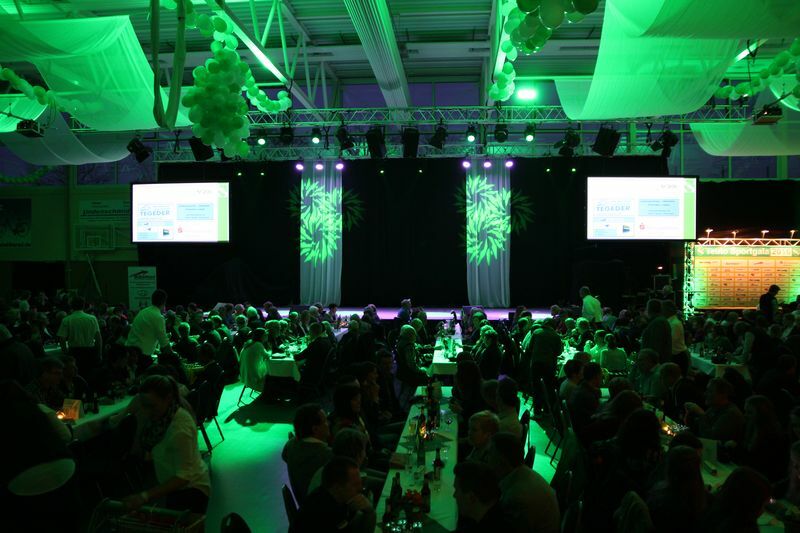 Reason enough, for VHV to celebrate its 20th anniversary in January and for bema to celebrate its 75th anniversary in May with customers, employees and business partners. 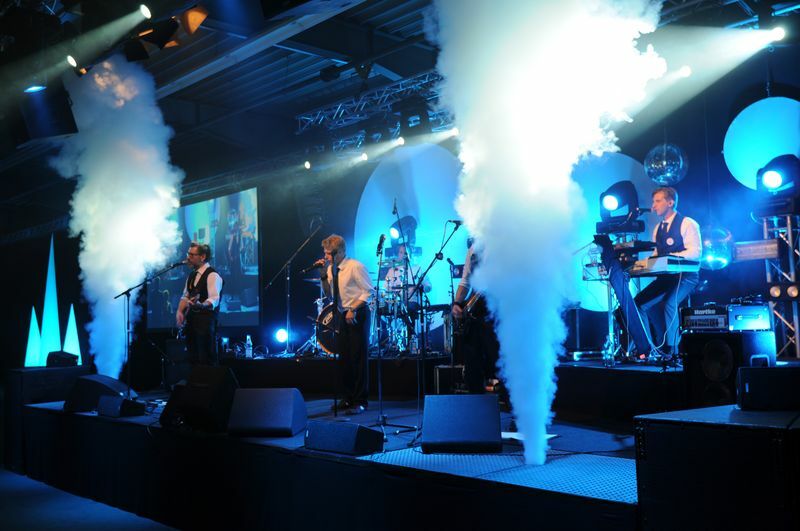 The management commissioned L&S GmbH & Co. KG with planning, organizing and equipping the event. 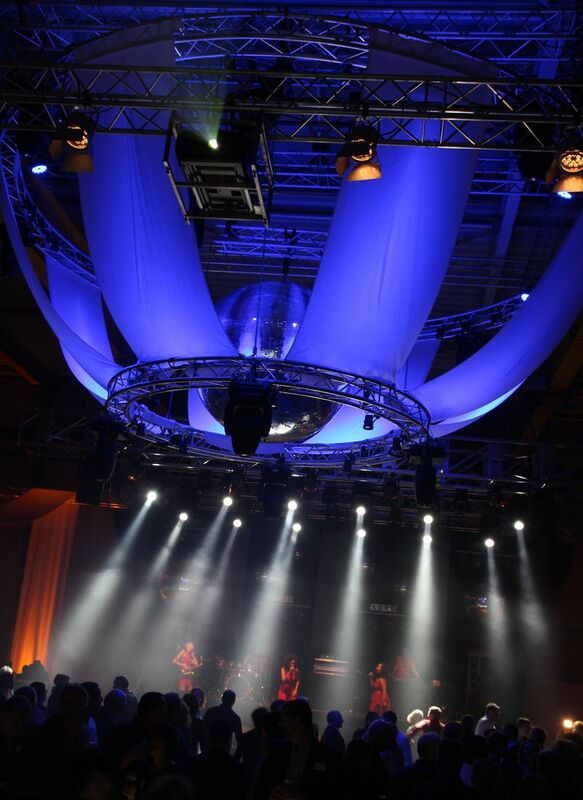 L&S GmbH & Co. KG supplied not only the typical services like sound, lighting and video technology, traverses and pedestals as well as decoration elements from the trade fair construction, but also all the other temporary fixtures to transform the assembly hall into an event venue. This included an exclusive display unit, tables, chairs, bar stools and a high-quality toilet container, a cloakroom and other decorative elements. Thus, various areas were built in the assembly halls, e.g. a reception area, a higher terrace with seating furniture, buffet areas and as a central element the dance floor with stage and bar. L&S installed the individual zones temporarily by means of curtains, mobile walls and room dividers and furnished them with stylish lighting. 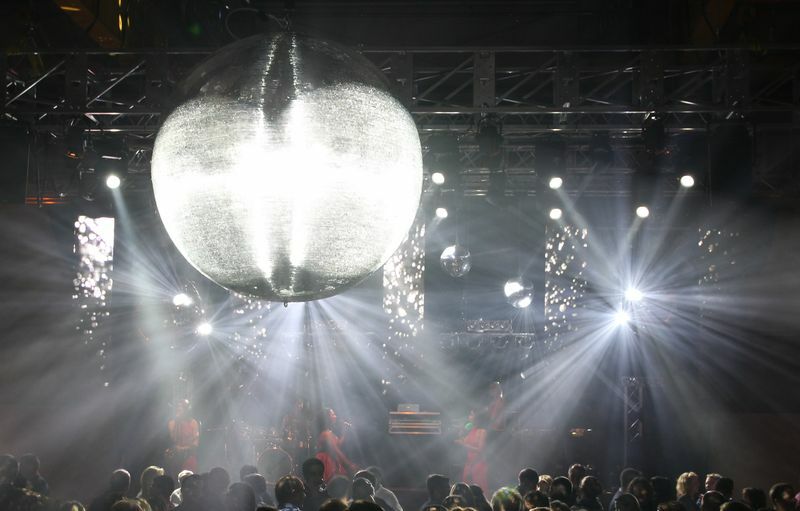 In the area of the dance floor and stage, impressive lighting effects transformed the halls into a disco. In addition to providing the “hardware”, L&S was also active in organizing the event. All the service providers involved were coordinated by L&S and matched with one another, from the menu card to the hotel contingents to the parking instructions. The concrete plans of the two jubilees began half a year before. Only a small time frame was available for the actual setups of the event since the final assembly of the conveyor systems and sweepers takes place in the halls. This tight timetable required detailed and precise planning by L&S. The guests arrived and were greeted with live music and cool drinks. Factory tours were carried out. Following, the guests were welcomed by the management. 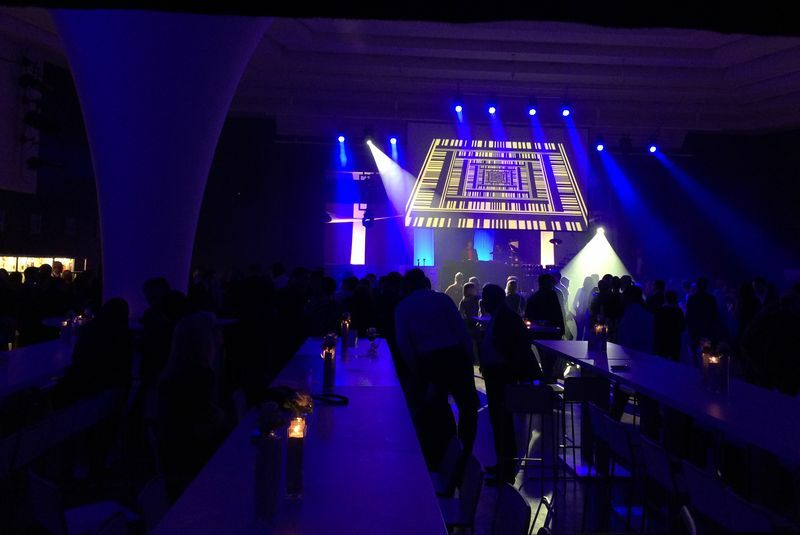 After dinner the atmosphere changed in the halls and a “party feeling” arose. This was realized by an extensive lighting installation by L&S. 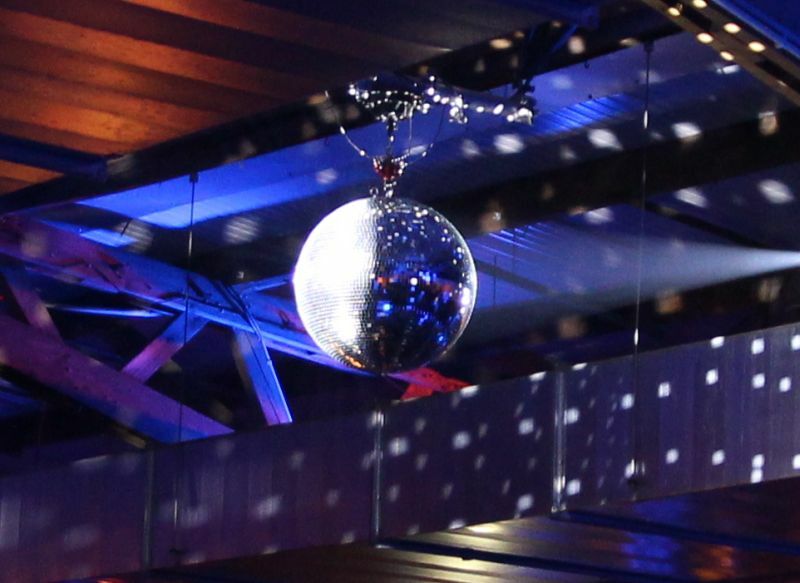 As a special highlight at the opening of the dance floor, a mirror ball with a diameter of 2.00 m (!) sank from the ceiling above the dance floor or a laser show started. 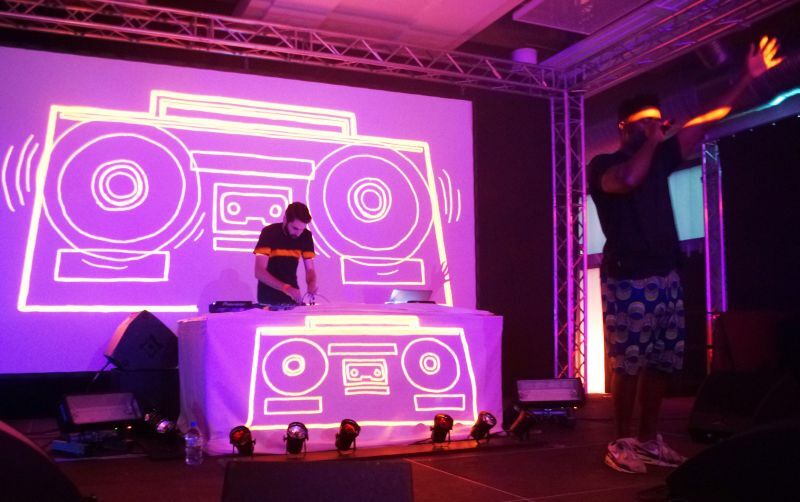 For the event, L&S provided not only the technical team for the control of sound and lighting technology, but also the event management as a contact person for the management and the other service providers. The event manager looked after the direction and coordination of the event and was available to answer all questions. Thus, the management was able to commit itself completely to its customers and employees and to participate in the celebration! It was only in the early hours of the morning that the event management handed over the keys to the dismantling team and coordinated the last trips of the shuttle service. One day later, L&S handed over the assembly halls to VHV and bema so that business could be continued as usual. 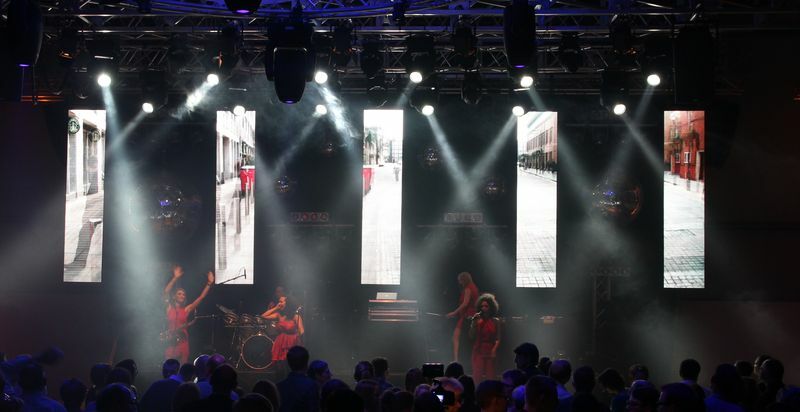 It began in 2006 with a public viewing on a twelve square meter projection screen for around 1,000 visitors. 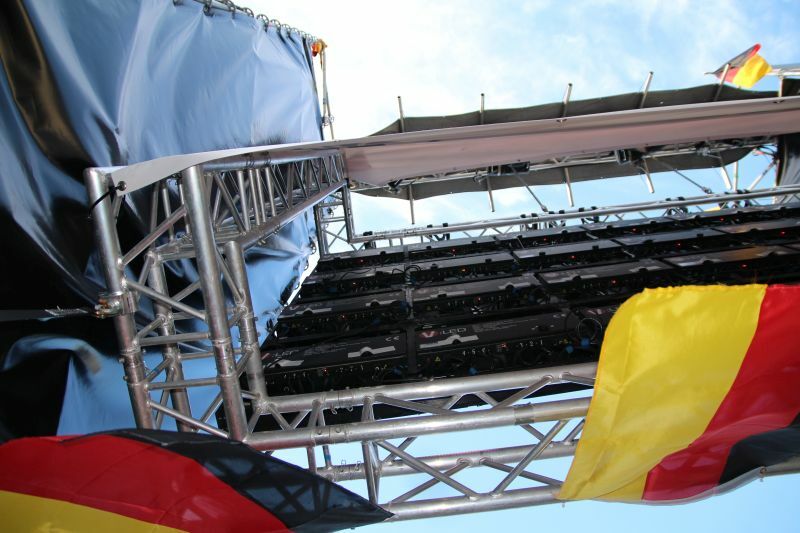 Five European and international football festivals later, in 2014, more than 2,000 enthusiastic fans watched the German team kicking off the football season. 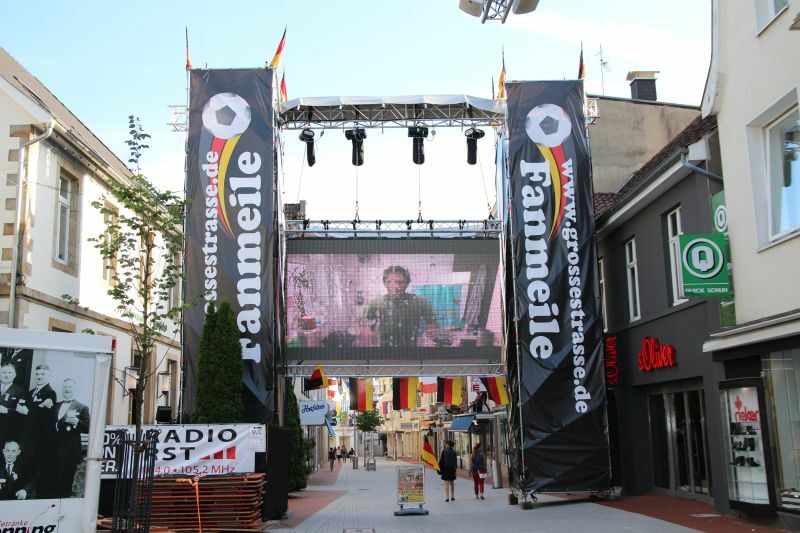 All of this was followed by an extremely bright and modern SMD LED screen provided by L & S. Our rigging department built two scaffolding towers measuring more than ten meters in height and only two by two meters in the ground plan as a storm-proofed supporting structure. The highlight: After the game, the screen moves down at the push of a button. The screen is then protected with protective panels and pulled upwards. In the parking position at eight meters, the screen is securely kept and, above all, under it remains much more than the necessary clearance for trucks and fire brigades. The second special feature is sound reinforcement. 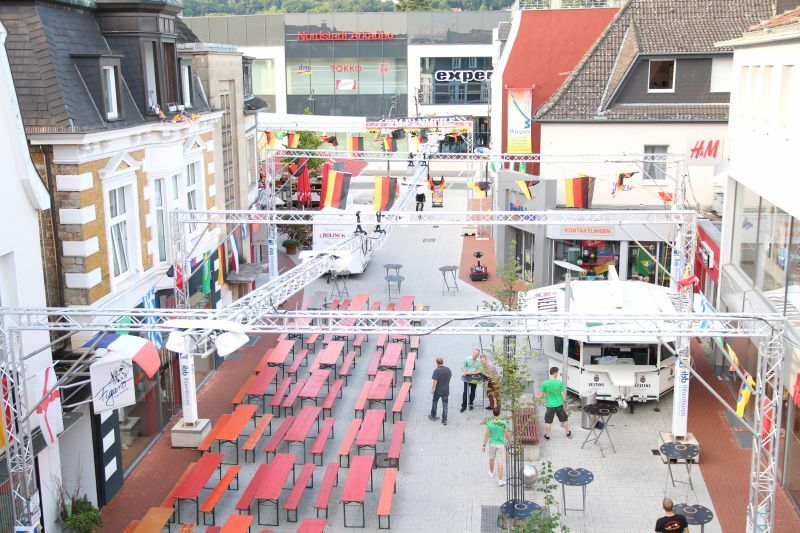 Showing 64 soccer games of the World Cup, in the center of the city of Ibbenbüren, makes it necessary to consider the needs of the residents. 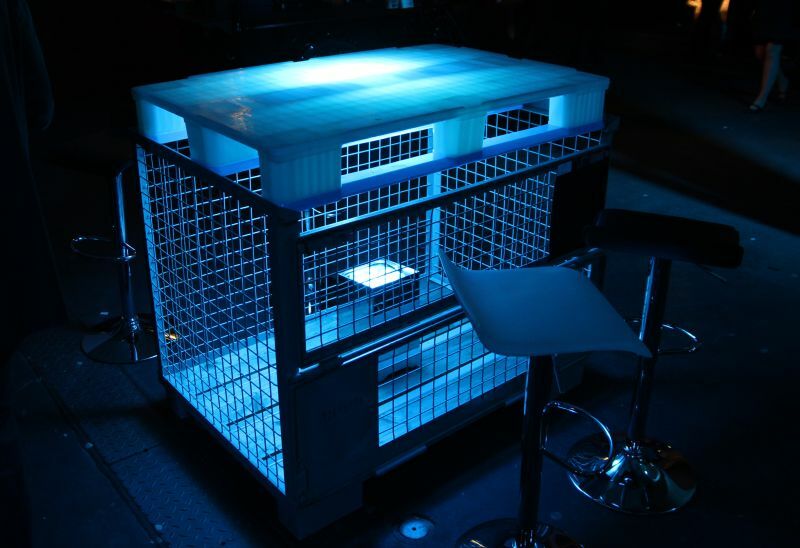 The acoustic irradiation is decentralized with the help of small loudspeakers, which are installed directly above the audience. The sound reflections are thus reduced to a minimum and the necessary volume for the football festival is reached only where it is necessary – there, where the fans are. 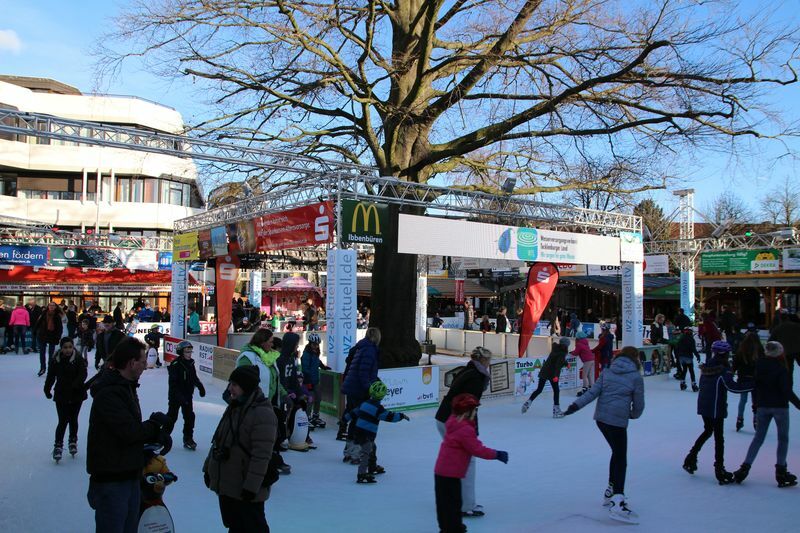 The measurements of the supervisory authorities also revealed: No complaints. 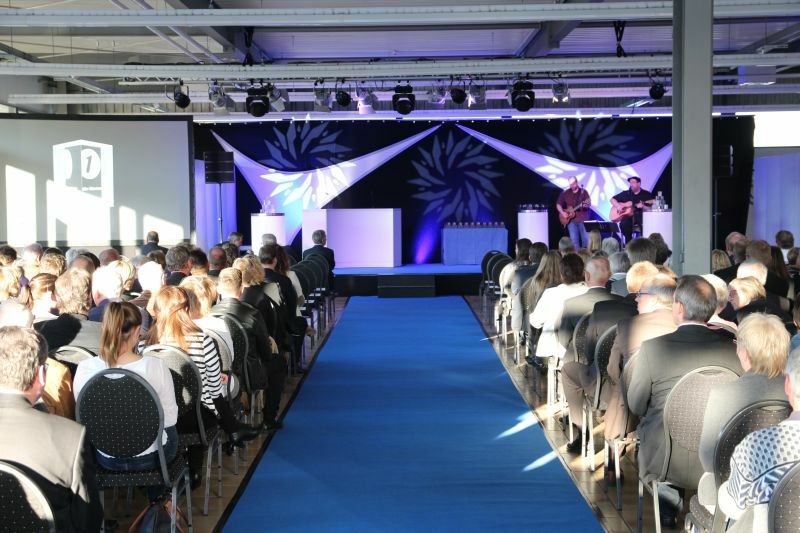 Noble suits and elegant evening dresses in the Halle Gartlage in Osnabrück? Those who know the Halle Gartlage, will smile now as the hall is known as an auction and exhibition hall for animals or because of its flea markets. 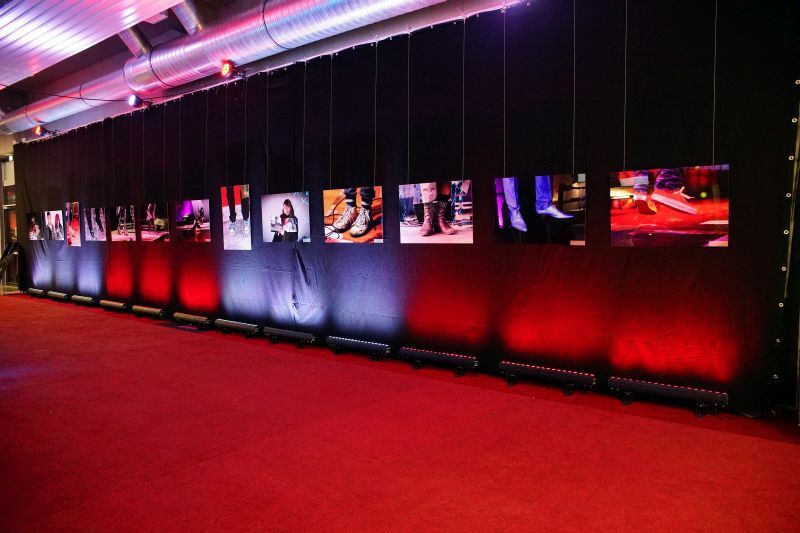 It was quite different at the breeders ball 2014: A good-looking, elegant outfit was compulsory for the around 4,800 guests. 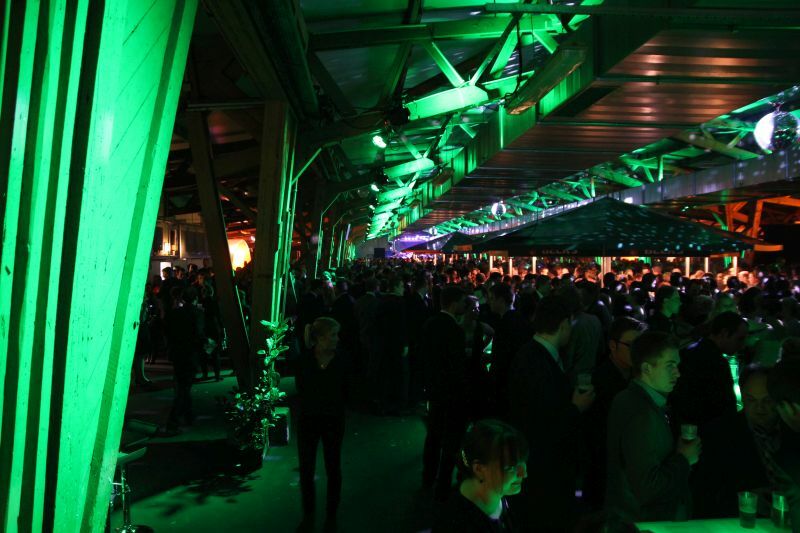 Therefore the Halle Gartlage also had to get dressed up. Three live bands provided a great atmosphere until the early hours of the morning. 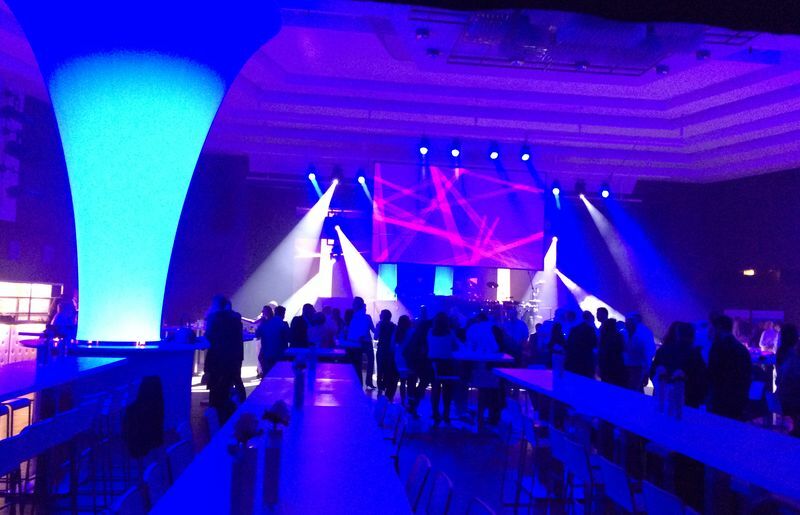 L&S was responsible to get the Halle Gartlage dressed up and therefore, L&S provided extensive installations in the three event areas as well as in the outdoor area, designed entrance areas, a cladding of the hall walls and decorative sails – and that was just the beginning. 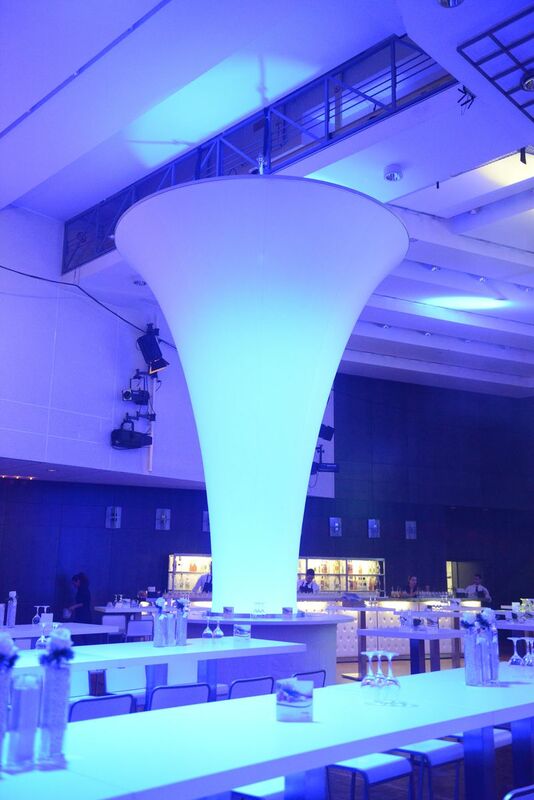 The main attraction was a stylish lighting, which provided a special ambience. 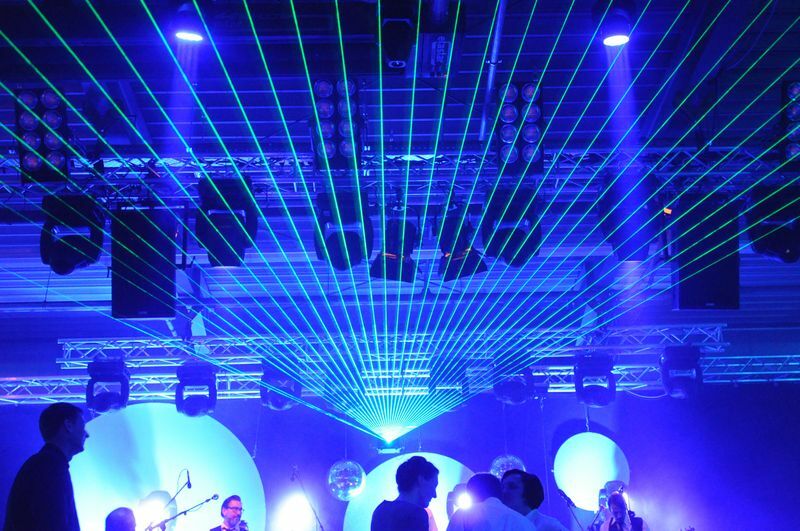 We, L&S used more than 250 LED spotlights and 36 moving lights. Real eye catchers were the high tables in industrial design. 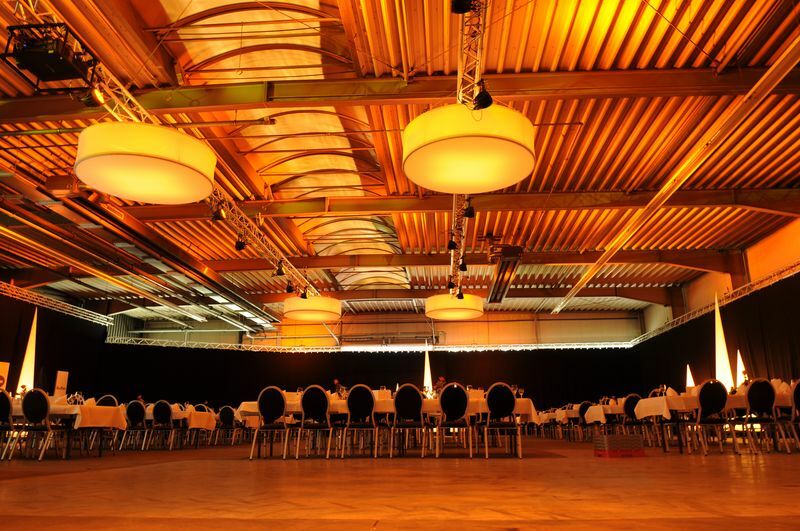 Those were organized by the catering partner of the Hall Gartlage. 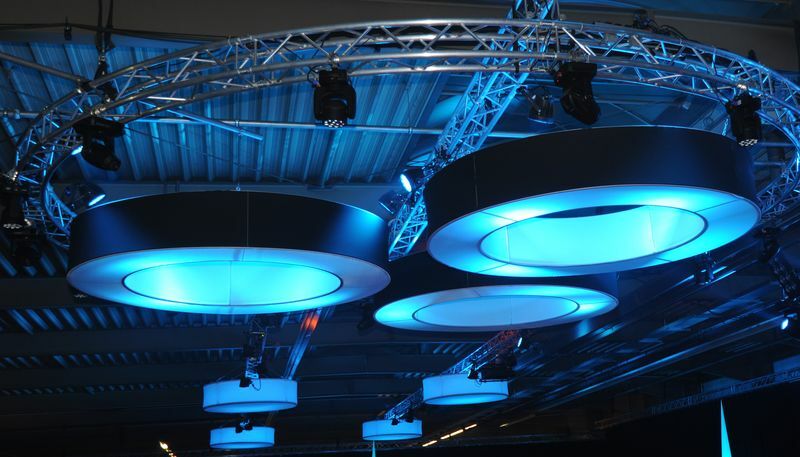 L&S delivered 64 LED spotlights which matched the design and which could be used completely without cabling. Powerful, rechargeable batteries and a radio control made it possible. The result: the floor was free of disturbing cabling and offered enough space for small talk and invited the guests to dance.